One of LG's best 4K gaming TVs is 40% off in Amazon's Bank Holiday sale... but should you buy it? It's only been a month or two, but Amazon Prime Day 2018 already feels like a distant memory, a hazy blur of bagged bargains and missed opportunities. But the deals never really end, do they? With the closure of one calendar sale season, there's always another one ready to jump around the corner. Case in point: Amazon is slashing prices everywhere for UK customers this week, as part of its Bank Holiday sale. One such slashed offer is the LG 55SK8000PLB, seen above. It's a 55-inch 4K Smart TV from one of the most respected technology companies in the world, and it's currently going for 40% off its original RRP of £1499, down to just £900. That's a saving of nearly £600, which is nothing to be sniffed at for such a high powered piece of kit. But, even at its discounted price, is this television worth a buy? It's already in our guide to the very best gaming TVs, but let's break it down, bit by bit, to see whether you should consider giving this one a purchase. Suffice to say, the LG 55SK8000PLB is an absolute stunner when it comes to the visual department. It's easy to spout off the TV's various technical acronyms (4K, UHD, HDR, LED, IPS. etc.) and leave it at that, but LG has also built in a Nano Cell Display, meaning that every pixel is positioned just one nanometre apart from the other. For the viewer, that means cleaner, more consistent colouration, all dressed up in a 4K resolution that really does live up to all the buzz you've heard about the next step up from high-definition. That UHD technology also means the LG 55SK8000PLB retains a consistent visual fidelity from any angle, meaning everyone in the living room - big or small - can enjoy its crisp, super-powered picture quality. It isn't an OLED, which is LG's premium brand of panel, but what it sacrifices in depth of blacks, it makes up for in the brightness of colours. So, for the money, the screen is excellent. 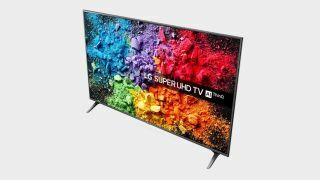 Often, the cheaper 4K TVs are those which maintain a decent level of picture quality at the expense of the in-built smart system, which can be slow or unresponsive when performing certain tasks. This isn't the case for the LG 55SK8000PLB, which boasts a ThinQ AI program that might just make it the smartest of smart TVs yet. ThinQ doesn't just effortlessly run a whole suite of apps at the press of a button, it's designed to be able to learn, think, and respond to any questions or requests you might have related to the TV's functions. It's even compatible with Alexa, just in case you were worried about having to replace your newly purchased Echo Device for a new model. This, on top of everything else, makes the LG 55SK8000PLB a very attractive option for those who can afford its slightly higher asking price. With 40% off in the Amazon UK Bank Holiday sale, it's still a lot of money, but you're getting back every penny you put in, as this 4K system really does live up to its promise as a prestigious and intelligent upgrade to your home entertainment.